Take a look at this figure from the OECD’s September 2009 Economic Outlook. It shows the policy rates for the three biggest central banks in the world since 2000. 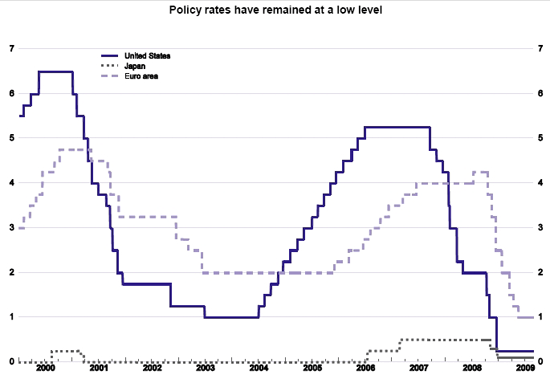 I find it interesting that the ECB and the BoJ appear to follow the Fed’s policy rate moves. The Fed is a global monetary hegemon. It holds the world’s main reserve currency and many emerging markets are formally or informally pegged to dollar. Thus, its monetary policy is exported across the globe. This means that the other two monetary powers, the ECB and Japan, are mindful of U.S. monetary policy lest their currencies becomes too expensive relative to the dollar and all the other currencies pegged to the dollar. As as result, the Fed’s monetary policy gets exported to some degree to Japan and the Euro area as well. From this perspective it is easy to understand how the Fed could have created a global liquidity glut in the early-to-mid 2000s since its policy rate was negative in real terms and below the growth rate of productivity (i.e. the fed funds rate was below the natural rate). Put differently, the Fed monetary superpower status meant it was able to stimulate global nominal spending in the early-t0-mid 2000s. Given there exits nominal rigidities in the global economy, this development meant the Fed temporarily pushed the global economy beyond its natural rate level.